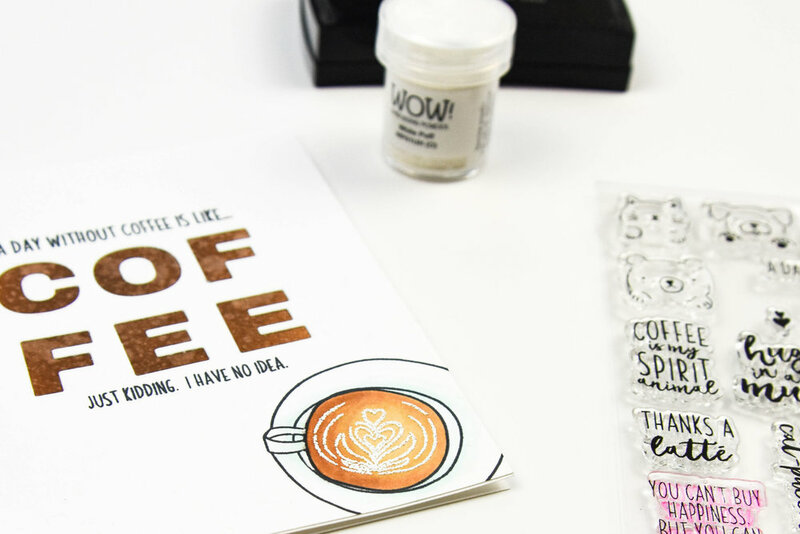 Today I’m sharing a super simple card using the new Breve Note stamp set from the February release by Ellen Hutson. I’m combining it with my go-to Essentials by Ellen alpha die set. I created a card base using some white cardstock. Then using some Distress Ink in Walnut Stain I colored the center of the card front using my foam blender. I sprayed some water on it with the Ranger Distress Sprayer and dabbed it with a paper towel. Next I cut an 8 1/2” x 11” piece of cardstock down to 5- 1/2” x 4 1/4”. Using the Essentials by Ellen Classic Block Alpha, I die cut the word “coffee” in the center of the cardstock. I stamped the sentiment just above the word “coffee” and just below it using my Mini Misti. Then I stamped the coffee cup in the corner and colored it with my Copic markers. I finished off the coffee cup by stamping the foam pattern with some VersaMark embossing ink. Then I used Wow! Embossing powder in White Puff for the foam. That stuff is the best for frothy lattes! Once I was finished with all the stamping and coloring, I adhered the 5 1/2” x 4 1/4” piece of cardstock to the front of the card base using a tape runner. I love how the coffee colored letters turned out! Thanks for stopping by today, I hope you liked the card! We’re still digging our way out of the snow here in the Pacific Northwest. It’s great crafting weather!